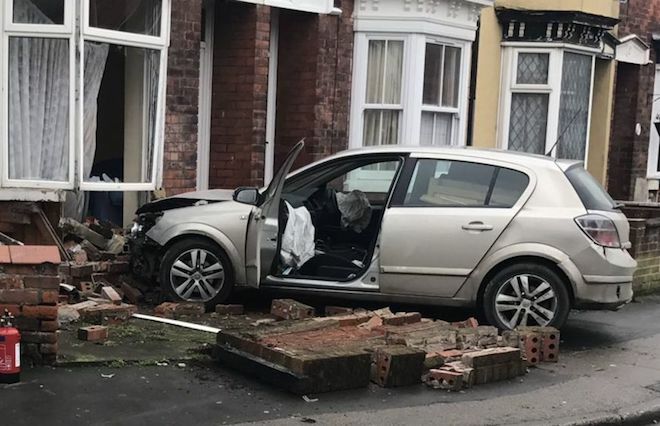 Two people have been injured and a number of homes evacuated after a car ploughed into the front of a house. The accident, which happened on Sunday in Grovehill Road, Beverley, East Yorkshire, involved a silver Vauxhall Astra. Sky News reported that neighbours in the surrounding houses were told to leave when it was found there was a possible gas leak as a result of the car damaging an outside meter. Several roads surrounding the house had to be closed following the crash, and motorists were advised to steer clear of the area. Mark Thundercliffe, 47, who owns the nearby Grovehill Convenience Store and alerted police after the accident, told the Hull Daily Mail: "I was serving in the shop and heard an almighty screech and then a crash. I came out the shop and saw a young man and a young lady exiting the car. They were very distressed. "The male driver then came into the shop to buy some cigarettes to calm his nerves. He said that his brakes just didn't seem to stop and his car just slid with it being a bit wet on the ground." Humberside Fire and Rescue station manager Matthew Sutcliffe told the newspaper: "When the crews got there the car had gone into the house. We checked to see if anyone was trapped and then we identified damage to the gas pipe which posed a potential risk. "At that point we couldn't ascertain whether or not it was leaking so we put a cordon in place and then we put out a water jet as a precaution. "We got some gas detection equipment which did not identify anything and the gas board confirmed this. The scene was then handed over to the gas board from a safety perspective. "It was quite a short, sharp incident but it was one where we had to take things as a precaution. "Everyone has returned back to their homes with I imagine the exception of the occupier of the property that was hit because of the structural damage to the bay window area." Sky News reported that it was unclear whether those who were hurt were in the car or the house, but that Humberside Police had said their injuries were minor.